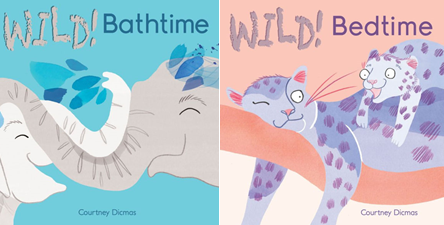 Bedtimes and bathtimes can be wild, especially when animal babies are involved! Sometimes messy, often chaotic and always exhausting, they offer perfect bonding opportunities. Courtney Dicma’s eye for detail perfectly illustrate the fun, laughter and love shared each day in family life. This is a custom Raising Readers flip book, combining two tiles: ISBN's 9781846436864 and 9781846436871 for Maine children to enjoy. Having a 15-month-old means having many routines! Getting dressed, having a meal, playing together, reading together, taking a bath, and going to bed. This paired set of board books offers all of these routines in one. There is lots of room for conversation and laughter when the animals children like appear in books and are doing the same things they do. When you are taking a bath or preparing for bed, remind your child about the animals in the book. For example: I am running the water like the mama elephant. I am putting water on your head just like the mama elephant did with her baby. This is how elephants and little children get clean. When you connect your child’s life with things that happen in books, books become more important to them. The more important books are to children, the stronger their reading will be when they go to school.